All trial lessons include temporary membership of West London Aero Club. You and your friends and family are welcome to relax in the clubhouse or even drop in for a bite to eat before or after your flight. Not long enough? you can always add an extra 10 minutes for £60 on the day. All times are chocks-off to chocks-on so in a 20-minute lesson, airborne time is approx. 12-15 minutes. On arrival at the airfield you’ll be met by your flying instructor or one of our experienced ground crew. 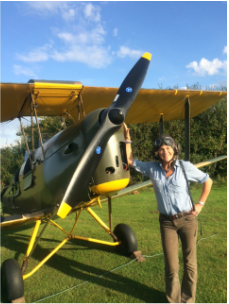 First we’ll help you look the part, kitting you out with a genuine sheepskin Irvin jacket, flying helmet and goggles (white silk scarf optional), before introducing you to our Tiger Moth and its controls. Don’t forget to bring a camera as there’ll be plenty of time for photographs before you take off. After strapping in, we’ll run through a safety briefing, then we’re almost ready to go. Your instructor or one of our crew will swing the propeller by hand to start the engine, then it’s chocks away and we’re off. 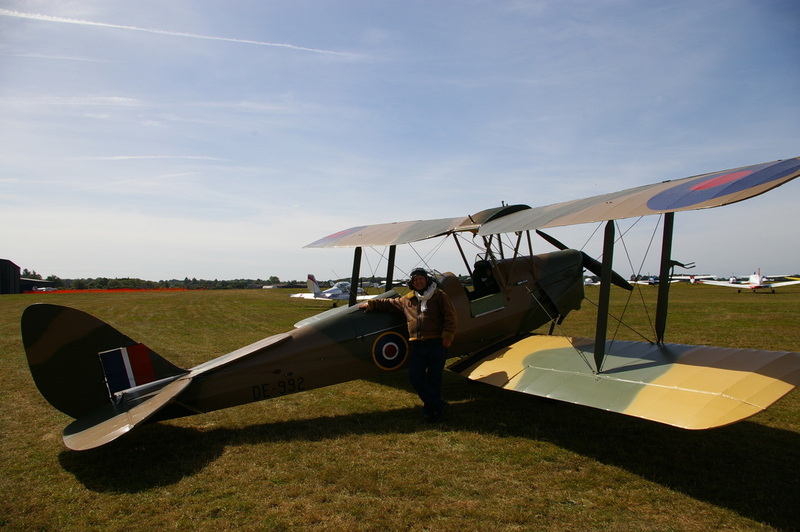 Once airborne, listen out for your instructor saying "you have control", then it’s over to you to fly the historic Tiger Moth. After about 20 minutes your instructor will say "I have control" and bring the aircraft back to the airfield and in to land. Warning: you may experience difficulty drinking after your flight due to the enormous smile on your face. The 30 minute trial lesson can be extended by 10 or 20 minutes to allow time for going a little further afield or simply spending more time at the controls. Just let us know on the day. Flight times of one hour or more are available on request. All times are chocks-off to chocks-on so in a 30-minute lesson, airborne time is approx. 20-25 minutes. Same experience as the 20 minute lesson but with twice the time in the air. More opportunity to to fly the Tiger yourself or let your instructor show you what the old girl can do. Enjoy a full day of flying in our stunning Tiger Moth, arriving in style for a spot of tea at Goodwood House, nipping to the Isle of Wight for lunch or enjoying a visit to the Imperial War Museum at Duxford. Got something else in mind? We'll put together the perfect day out for you or someone special. Get in touch with our pilots for an estimate based on flying times and landing fees. Vouchers are available from £160 for a 20-minute trial lesson.